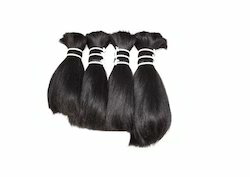 We are recommended amongst the clients for offering a quality assured assortment of Double Drawn Hair. Color: Natural Colour are available. Type Of Packing: Clear Poly Bag. With enriched industrial experience, we have been able to offer a wide spectrum of Single And Double Drawn Hair. Remy Double Drawn Hair We are engaged in offering our clients fashionable Remy Double Drawn Bulk Hair, which are very popular in the market nowadays. Further, these hairs can change your appearance just by changing your hairstyle and give you a completely different look. Moreover, these wigs give you very natural look. We are a most trusted name amongst the topmost companies in this business, instrumental in offering high quality array of Remy Double Drawn Black Hair. S M V Impex & Co.